Schools & Language School Groups. With seating for up to 60 people we can easily welcome whole class groups. We have experienced studio assistants to help your own staff. Each student will create a souvineer of their trip to Brighton! Whether it is painting on ceramics or playing with clay, including learning to throw a pot, our experienced studio assistants will make your event a fun creative experience, ideal for creating a personalise souvenir of your students visit. We have special packages based on weekday bookings. Prices will vary depending on numbers. 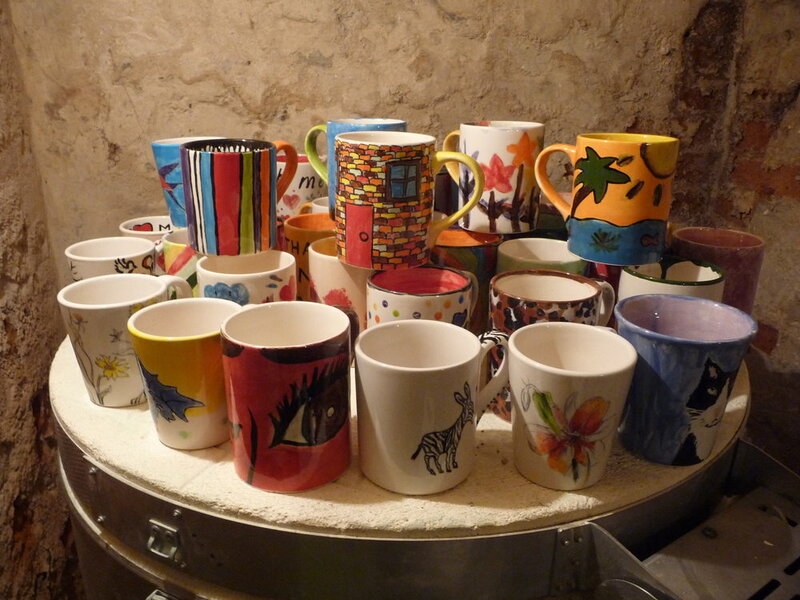 Packages for painting a mug start at £21pp. While we can offer whole class groups at our venue we understand it is not always possible to bring a whole class to us. However we are happy to come to you! Please complete the form below to request a brochure. Your host will fill the students full of inspiration, with bundles of tips and tricks on design and painting their piece. They will be close by throughout your session to host and answer any questions. Pottery is glazed and fired after your party, ready for you to collect at a later date. Ideally you will allow 48hrs for collection.